A current look at the SPC General Severe Weather Risk that has been put out this morning shows a slight shift Northeast in overall coverage area but generally the same areas as outlined yesterday. 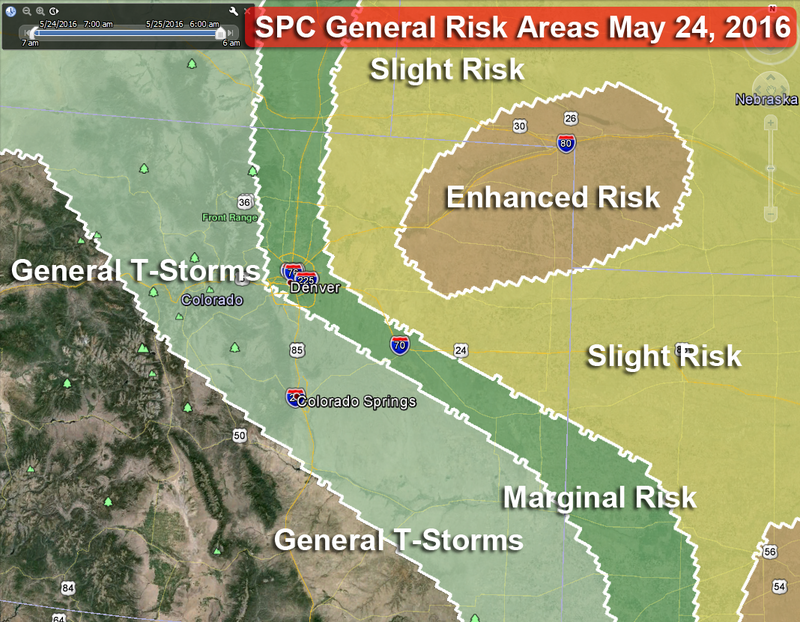 Northeastern Colorado looks to see the main threat of severe weather this afternoon with areas in and around Denver with a less risk, but not zero risk. 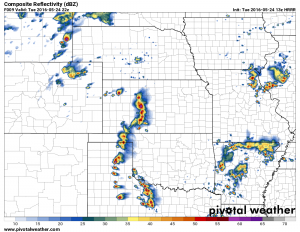 This is a bit of a long update but I explain the areas of most concern and the risks they’ll be facing… and as always the more technical synopsis area at the bottom of the article for the weather nerds in the crowd. 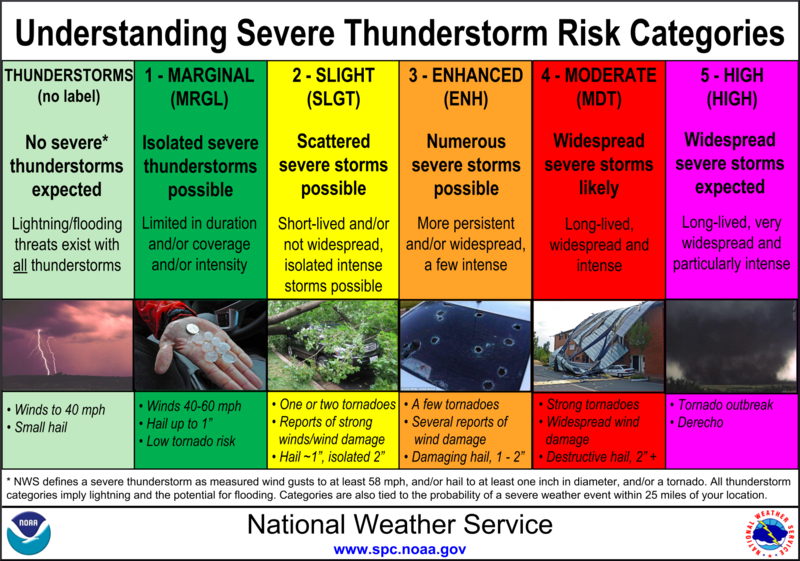 As you can see, our main areas of concern will be those in the slight and enhanced risk area. DEVELOPING DENVER CYCLONE...IN A BACKGROUND UPSLOPE FLOW REGIME. In English, this basically means that upslope flow will contribute to a boundary setup somewhere where the Denver Cyclone establishes, this is an area where we would look for better chances of severe storms with tornadoes. 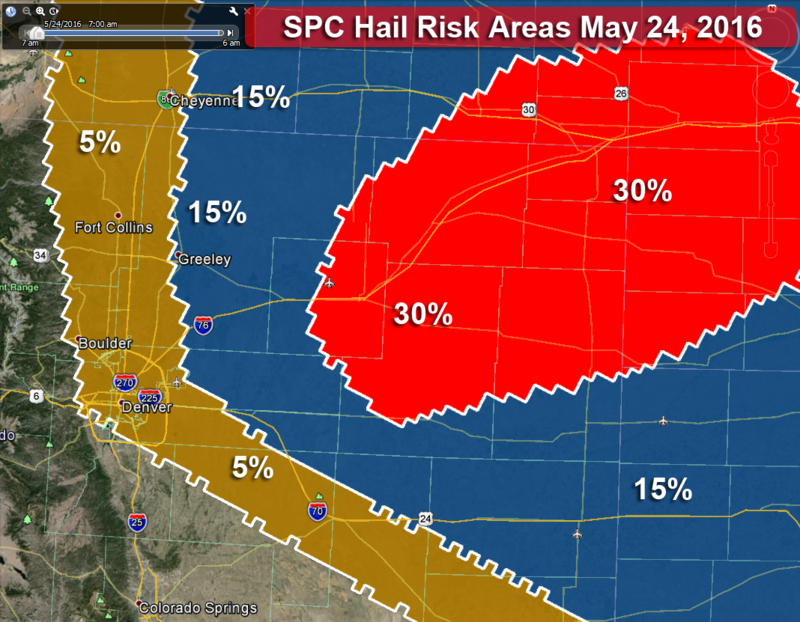 The hail risk generally follows the enhanced risk area and slight risk area, there is a pretty decent chance these storms that form in the area will contain large hail. 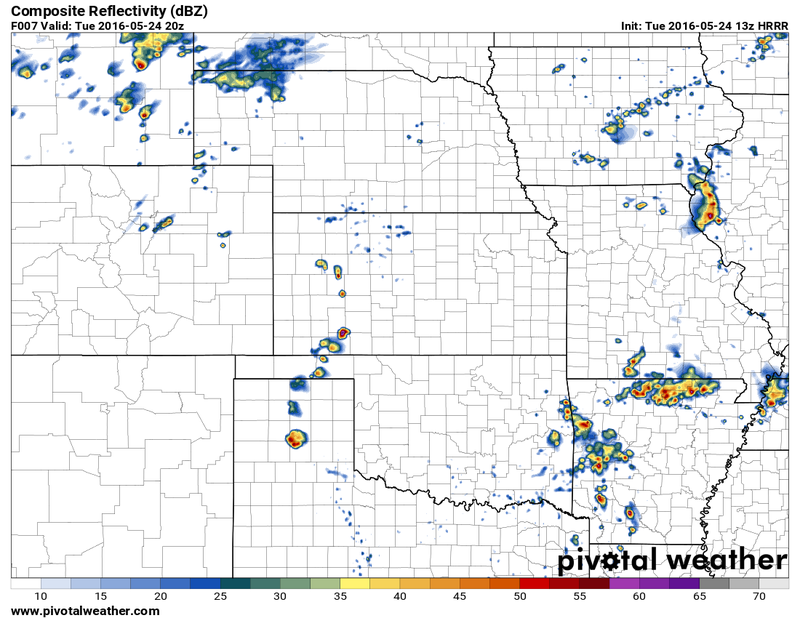 The unstable atmosphere and ample moisture will allow storms to establish strong updrafts. This means hail will have more time to form and grow larger before falling out of the storm. For those of us in Castle Rock, Elizabeth, Kiowa, Limon; the chance of severe storms is there but is quite a bit lower than the other areas I’ve mentioned above. 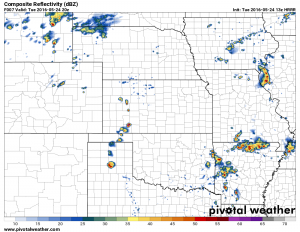 I took a careful look at the short range radar and saw most of the storms firing well North of us and moving to the Northeast. 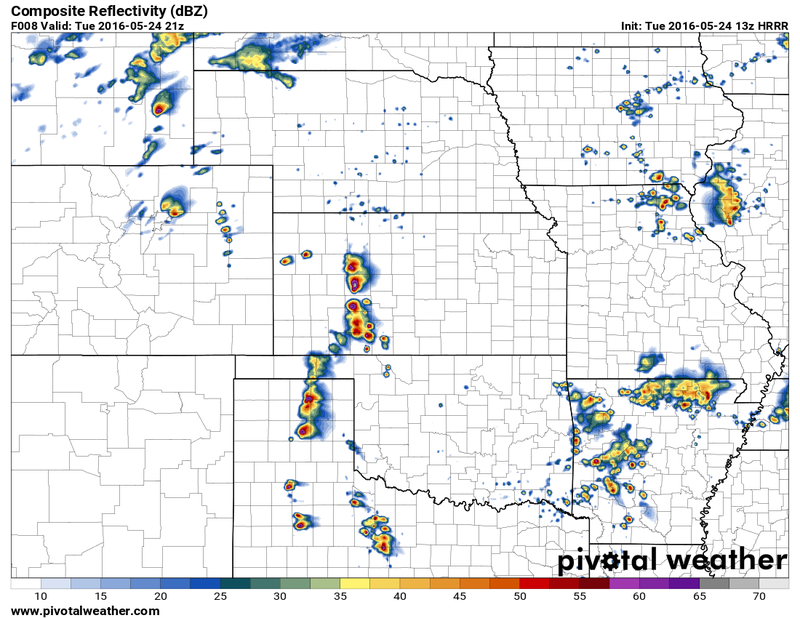 4PM simulated forecast radar. Large storms moving up and along the I-76 corridor, as they move out of Denver and into this area, the atmosphere is more favorable for severe weather. 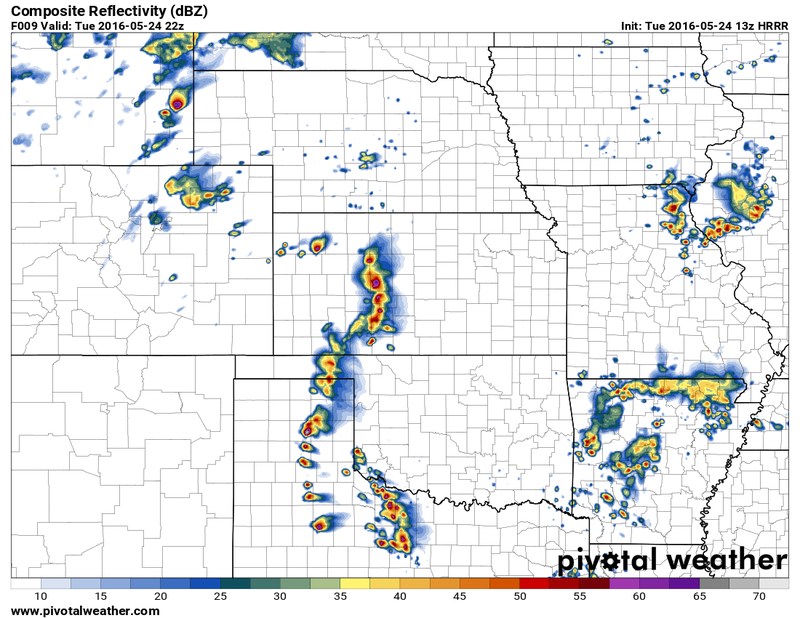 7PM simulated forecast radar. 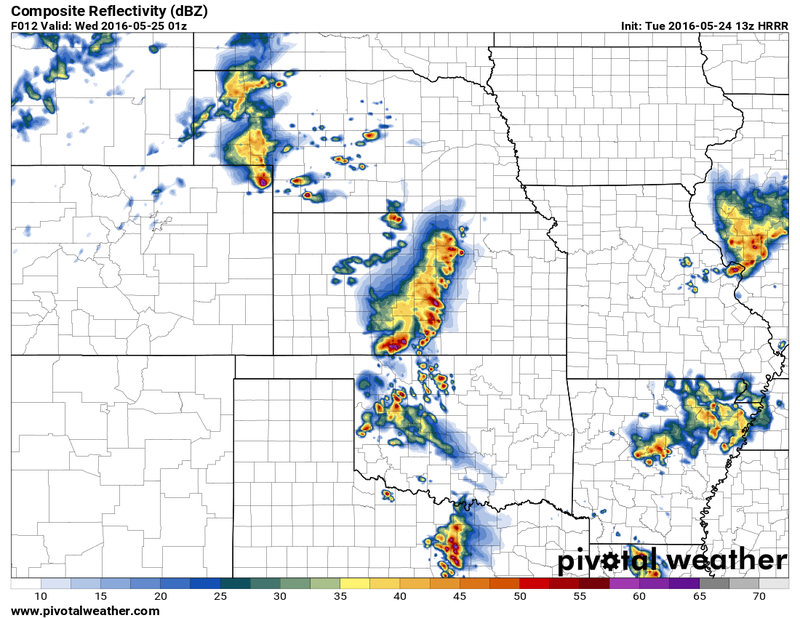 By the evening hours most storms will be moving out of the state. The atmosphere behind them in Colorado looks to be too stable for any more big storms to form. The area of greatest concern for severe weather today is an area extending from DIA to the Northeast and along the I-76 corridor. If you live or work in these areas please keep an eye to the sky. The timing looks to be between 2-6PM today, storms will initiate by 1-2PM and move Northeast into that area throughout the afternoon. 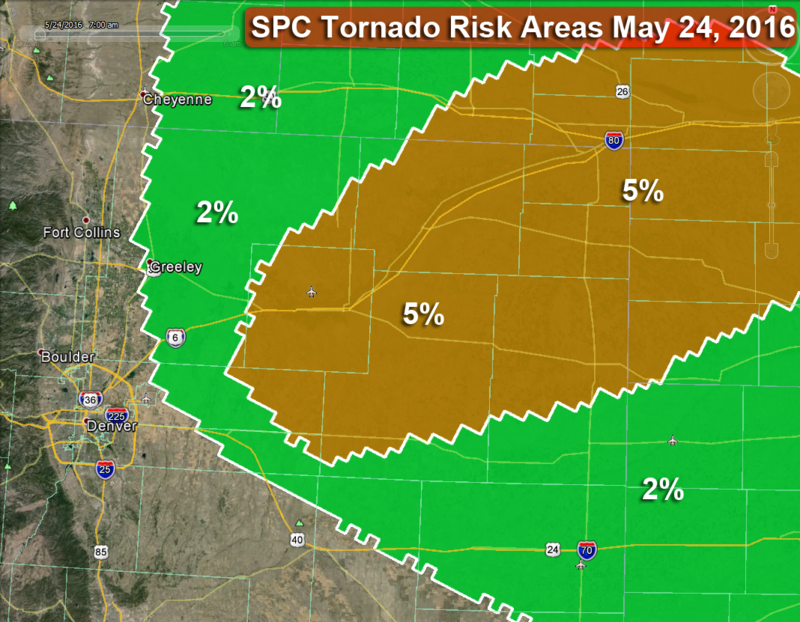 The tornado threat is elevated mainly along the enhanced risk area along the I-76 corridor, this area will have the most favorable conditions for these storms to get nasty. For us along the southern sections of the Palmer Divide (in and around Castle Rock to Limon) I’m not terribly impressed with our chances for severe weather today. 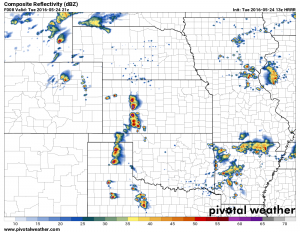 No model I could find had severe storms over our area today, not to say this can’t change but as of writing this, I’d just keep an eye out in case things change. I don’t see a widespread severe threat along the Palmer Divide at this time. Stay tuned as I’ll pass along any changes that come in over the next few hours. Stay safe and weather aware today! 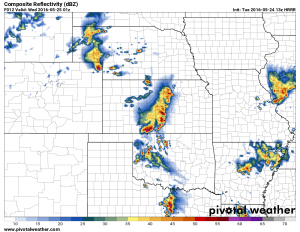 Three important ingredients need to come together for decent severe weather and in Northeast Colorado will likely see those come together this afternoon. Destabilizes the atmosphere as heating near the surface causes warm air to rise. This air will rise and condense into clouds and eventually storms if moisture is ample enough. Temperatures should be in the 70’s to near 80’s across Northeastern Colorado so don’t think heating will be a problem. The moisture available the more fuel for thunderstorms. Severe storms need heat to initiate and moisture to survive, if it is too dry they will fall apart without a fuel source. Moisture allows thunderstorms to continue to build. Dewpoints look to be in the 40’s and near 50’s in Northeastern Colorado this afternoon, this is low for many places in the Midwest but for Colorado it is decent. 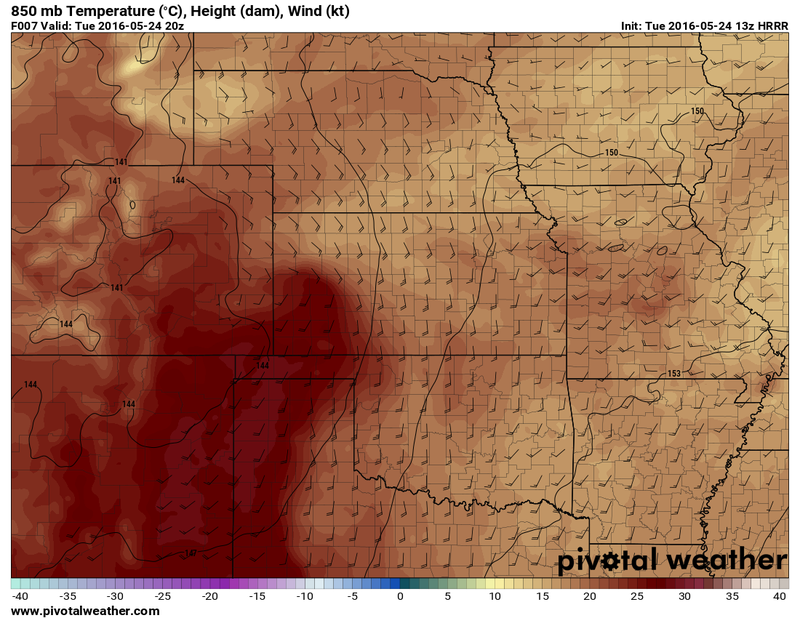 Upslope flow from a storm system setting up on Southeastern Colorado will provide the moisture along the front rnage. Wind shear or differing speeds and/or directions of wind at different heights of the atmosphere are necessary to get a super cell thunderstorm to survive. Wind shear allows the storm to rotate, this is essential because it allows the storm to maintain an updraft and continue pulling in warm, moist air to stay alive. Without it, the storm would eventually rain itself out, cutting of its fuel source and die off too soon before it becomes severe. Winds at the surface are out of the South-Southeast while winds aloft are out of the Southwest, this should provide ample rotating motion in the atmosphere. Notice Northeastern Colorado maintains dew points in the 40’s and 50’s while we fall into the low 30’s. This shows me storms in our area will have a hard time forming and any that do will have a tough time growing too large.